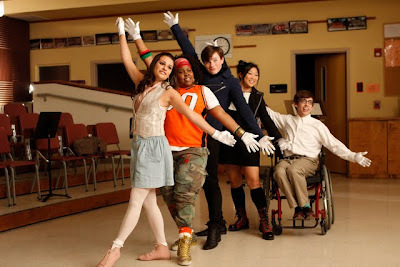 Given their tendency to belt out musical mash-ups created solely from Journey’s song catalog, dress like Lady Gaga, and unleash the power of Madonna, it’s no wonder that Glee’s group of tuneful outsiders are incredibly unpopular at Lima, Ohio’s fictitious McKinley High School. Yet proving that most of us still haven’t gotten over our high school horrors of life in a fishbowl complete with a caste system, while aspiring Barbra Streisand ingénue in training Rachel Berry (Lea Michele) may not be able to avoid getting Slushees thrown in her face on a regular basis onscreen, offscreen Rachel and her fellow show choir members have become massively popular icons of pop culture. 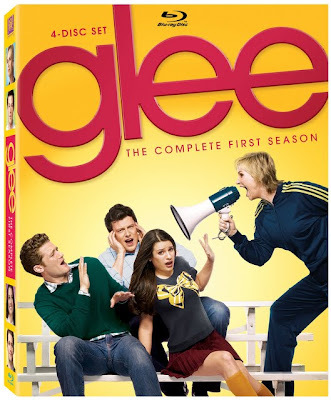 Network television’s comedic answer to cable’s dramatic series Mad Men , well before it had marked a year on air, show-runners’ Ryan Murphy, Brad Falchuk and Ian Brennan’s musical creation Glee garnered a Golden Globe award for Best Television Series – Musical or Comedy, which helped catapult the series to earn the most genre Emmy nominations for its first season alone. And even though it only received four Emmy statues, audiences have embraced this unique blend of musical comedy in an unprecedented way. Initially applying a Bad News Bears meets style classic sports set-up, as the series begins, likable Spanish teacher Will Schuester (Matthew Morrison) becomes the new head of the school’s fledgling glee club of which he’d been a member roughly fifteen years earlier. 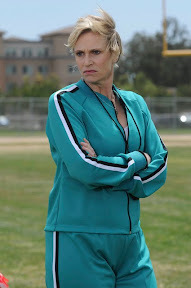 Needless to say, although the underdog premise is nothing new, filtering it through the realm of musical comedy while working in campy drama, coming-of-age woes, love triangles and baby bumps, along with MVP Jane Lynch as McKinley High School cheerleading coach and Will’s arch-nemesis Sue Sylvester, keeps us thoroughly entertained. Unafraid of finding humor in the oddest of places including a fired male teacher who was drawn to a buff student and a brief nursing stint by Will’s wife Terri (Jessalyn Gilsig) who supplied kids with allergy medicine for the “high,” early on Glee was slightly reminiscent of Election given the satiric tone as well as the characters of over-achiever Rachel Berry and the sweet but dim jock Finn Hudson (Cory Monteith). Eventually however, the series traded its flirtation with dangerous gags for heartfelt confessions and the recurring theme that the only thing you should be is true to yourself, preferring to make Sue Sylvester the epitome of all things sinister. 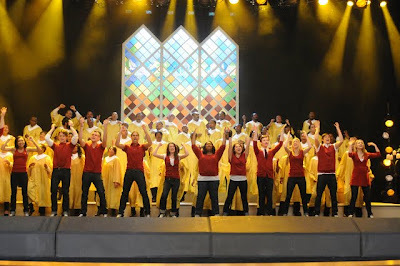 For the most part, sunny, infectious, and sing-along great, admittedly there are times wherein – similar to Broadway musicals – the over-produced numbers sometimes derail us completely from our suspension of disbelief, causing the plot in between performances to feel like commercials airing on MTV. On the one hand, it does earn points for diversity regardless of the fact that a majority of the characters that comprise the group are so cookie-cutter clichéd characters that one kid is jokingly called “Other Asian” and the cheerleaders are never without their uniforms. Yet on the other hand, stereotypes seem to drive far too many plotlines. 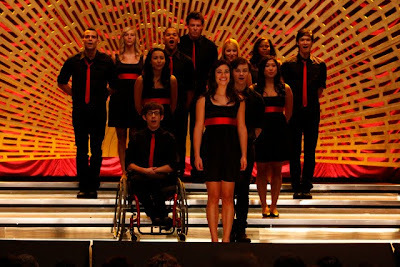 Additionally, while fortunately it’s so downright joyous that a smile remains on your face throughout, unfortunately, aside from a worrisome tendency to make a majority of its female cast mates scheming, dysfunctional liars, Glee also sends off red flags at times for exploiting disabled individuals to “teach a lesson" to its able-bodied characters. Although I applaud the attempt to make viewers aware of the plight of the disabled population, despite their good intentions, from bringing out Sue’s Down syndrome afflicted sister only in episodes where Sue needs to become more sympathetic to inventing a paralyzed football player friend of Finn’s to make Rachel realize that there are people worse off than her, it’s a depressing screenwriting trend wherein people turn into props. 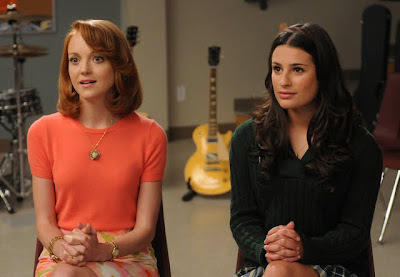 Basically, Glee has an affliction all its own – a double edged sword due to its success and recurring quality as we hold it to a much higher standard than other series since it’s one of the sharpest and most frequently pleasurable shows currently on air. And now that the first season’s duplicate, overlapping love triangles and pregnancy plotlines have been resolved, I’m eager to see Glee continue to evolve in new directions just like their eponymous group and if the twenty-two episodes witnessed in this gorgeous Blu-ray collection are any indication, the best is yet to come. Let the Slushees fly!